Most likely thanks to Facebook and Instagram, I got it in my head that it would be fun to try one of those Color Run events. It definitely looked messy, but kind of unique for a fun run! 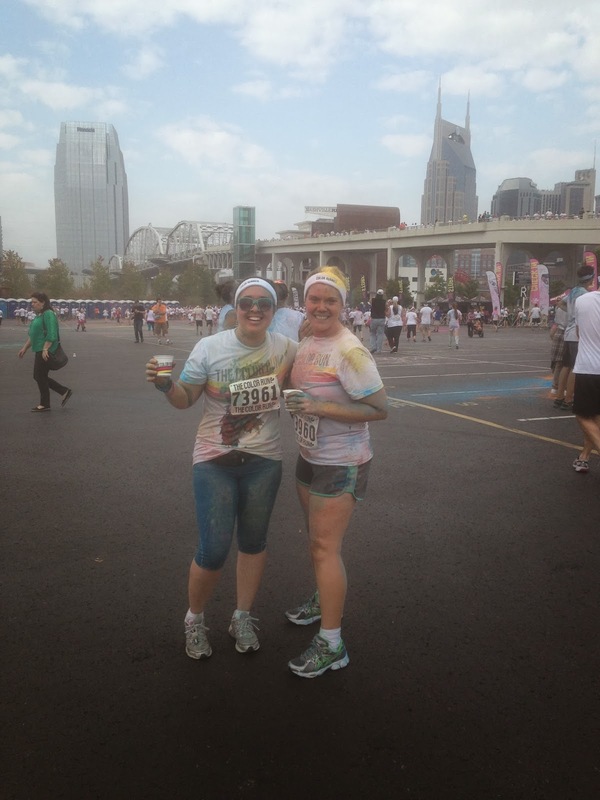 The Color Run happens twice a year in Nashville (and all over the country), and I got my friend BD to sign up with me for the run. We showed up super early to beat the crowds (12,000 people, to be more precise) and got to enjoy a bit of the pre-run festivities while still sparkling clean. We even did a Zumba workout with the crowd to get warmed up! As our start time approached, we were corralled (a lot like cattle) to the starting line. I had my Garmin watch ready to track our pace and distance, and we were OFF! The frustrating thing about The Color Run? I know it's just a fun run, but they don't try to put you into corrals by pace like other larger races. So for about a half mile, all we could do was weave around walkers. Thankfully (and painfully) the race started with a climb over Shelby Pedestrian bridge. The uphill climb helped us wade through the crowds, though we were a bit exhausted after rushing through everyone. Once we finished, there was a big area for an afterparty and celebration. There were food trucks too, as well as free Kind bars as part of a sponsorship. We were pretty tired though (hilly course! ), and since we ran in the very first group, we didn't feel the need to wait for another 12,000 friends to come through and finish! So we headed home to shower up and scrub off the color. Check out that Nashville skyline! Still, it was super fun to run the race with BD; since running a good time was nearly impossible, we did it for fun and had a conversation the whole way. It was the perfect way to catch up and get a workout in at the same time. 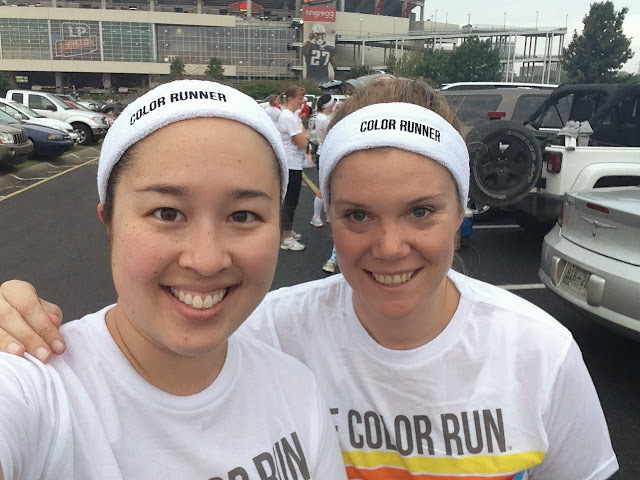 I don't think I'll be doing a Color Run again, but it was fun to try it once! 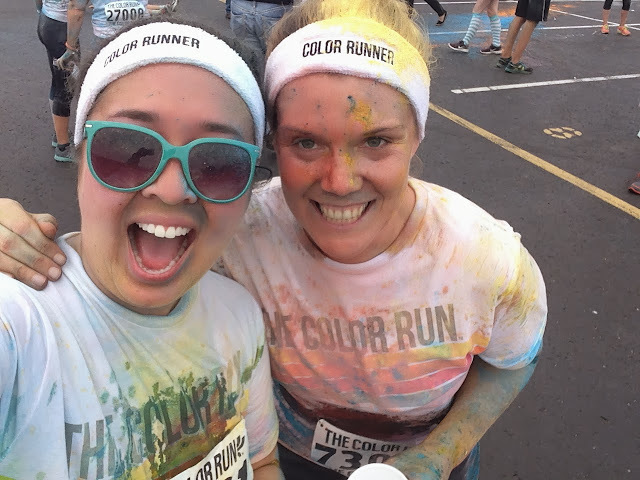 I did the color run last year in Portland. Super fun. SUPER HUGE MESS AFTER. 5 girls + 1 Shower = Crayola Crayon Factory Blow up!